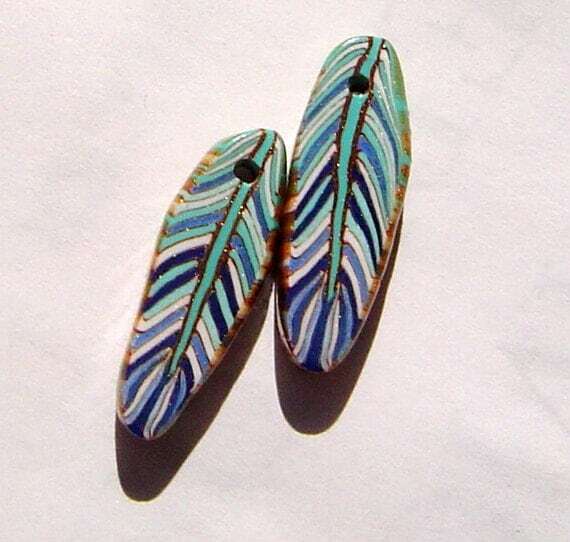 Here are some of the wonderful art beads that have been posted to the Art Bead Scene Pinterest Board in response to the June Challenge painting, Feuilles, by Louis Seraphine. All just stunning!! As in past months, this post is about meeting some of these art bead artist who have contributed. 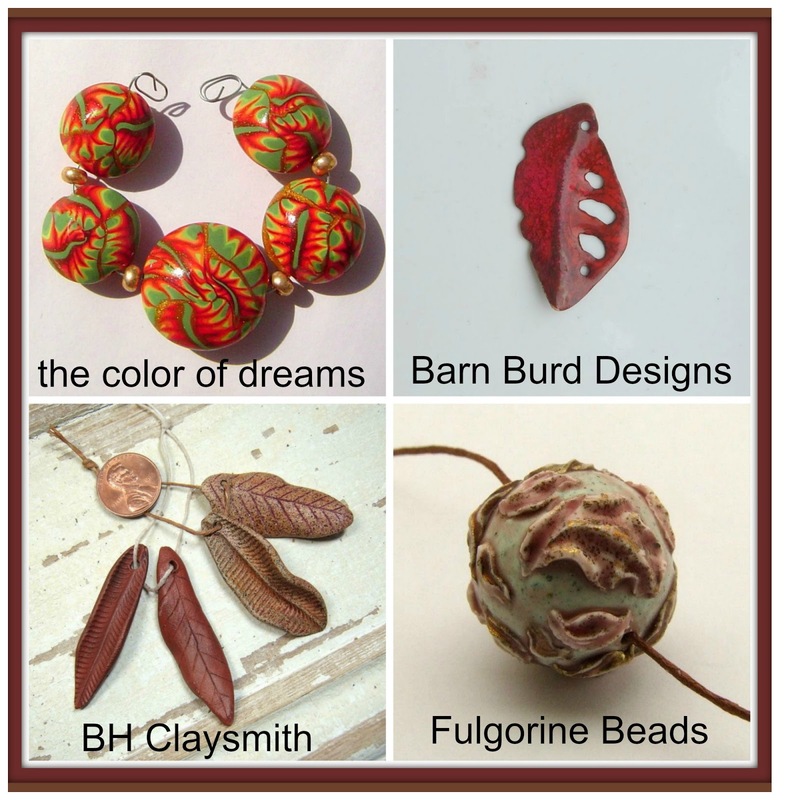 You may remember meeting Barbara Handelsman of BH Claysmith and Cate Van Alphen of Fulgorine Beads in previous posts. I have highlighted their names with links to those posts. This month I am please to introduce you to Katherine Thompson. She tells me she has been an artist all her life making paintings and sculpture. 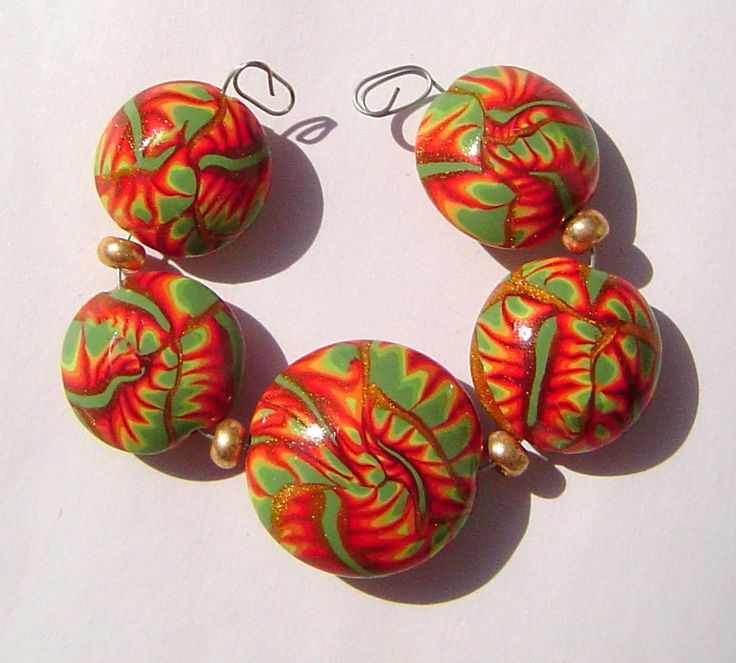 More recently she began making jewelry and now is focusing on making art beads and jewelry components. 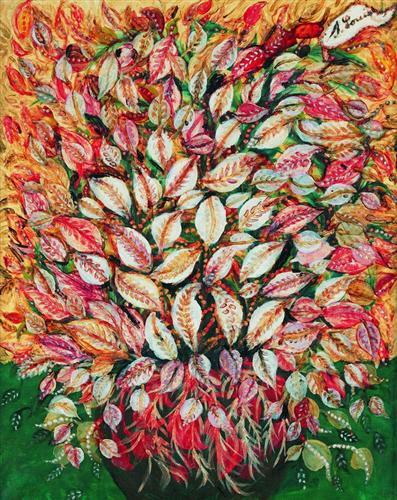 Katherine told me: When I saw the painting there was no second thought for me, I love leaves. When I was young I had the wonderful opportunity to live on 10 acres with horses, cows, an assortment of fowl, cats, dogs, gardens and huge trees. I used to walk around our property with a bird book and a tree book. I would try to identify them, I am a nerd. I love to learn. 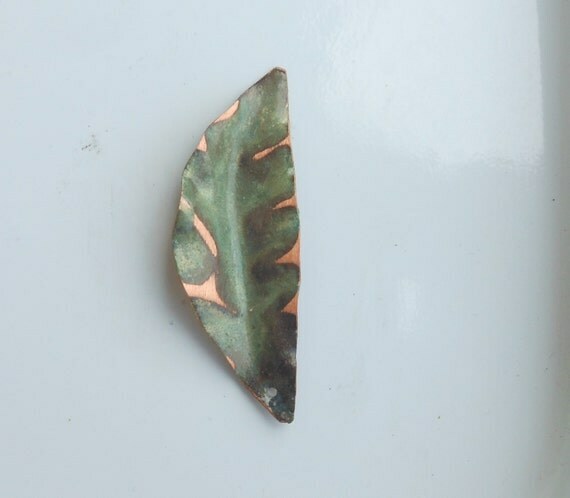 I am drawn to using my hands so I absolutely love shaping copper. Little sculptures. The leaves in this painting fit round peg into round hole for me. I could spend the rest of my life on leaves inspired from this painting. Katherine likes to work with copper and describes her process: I am drawn to using my hands so I absolutely love shaping copper. Little sculptures. 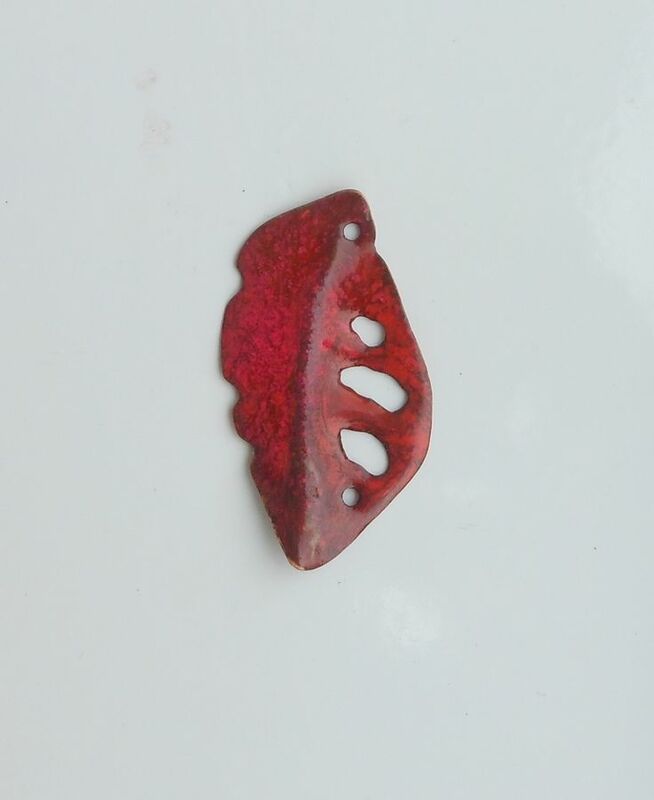 I love enamel work too and have a tendency to improvise to get what I want. Somewhat like the featured artist I used what I have been playing with to get what I wanted. I used the Utee melting pot with the clear embossing enamel and shaved pastels on to my leaves. I had the freedom to mix, leave chunks, dots, drools, swirls, make my own colors. In this way I was able to apply a more painterly approach to my work and truly create a one of a kind piece. You can read more about Katherine on her blog where she explains her business name and how she is changing over all of her sites so they will be in sync and visit her Etsy Shop to see more of her work. These stunning beads were posted yesterday afternoon to our Pinterest Board and I did not have time to speak with the artist Pat Handschuh of The Color of Dreams but wanted to include them and give you some links where you can get to know her work better. 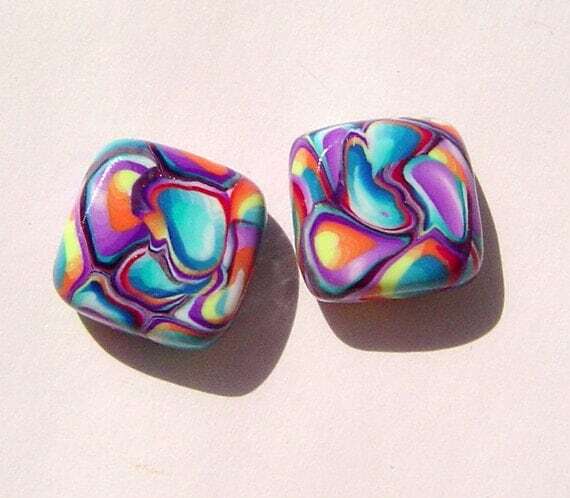 She has an Etsy shop called The Color of Dreams Boutique where she sells her amazing handmade polymer clay beads. I learned from her shop profile that she has been making art beads and jewelry for over 10 years. I have included a couple of pictures of her beautiful beads. You can read more about Patricia Handschuh on her blog thecolorofdreams. 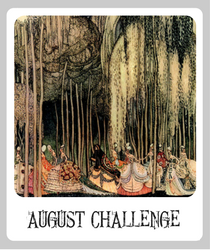 She has a post explaining how she made her beads for this month's ABS Challenge. Thanks so much for stopping by today and checking out these art bead artists. Hope to be back next month with more new folks to introduce you to. Thank you so much for showing my beads. I am very honored to see my beads displayed on the ABS. I love reading all the articles and to see all the projects that are made because of the challenges. Thank you for such a wonderful write up and for these other bead artists! I love being inspired and pushed by such talented people! Nice spot light post on these Artists! Way to go ladies! Look forward to seeing what you make in the future! Lovely interpretations and each is so different. Kudos to the bead artists.